He lays among his books in his tiny attic room. Oblivious to the world around him, his quill held in his mouth while he uses his fingers to count the meter, The Poor Poet plies his trade. Like so many of the German painter Carl Spitzweg’s paintings, this one combines a look into real life with a tinge of humor. 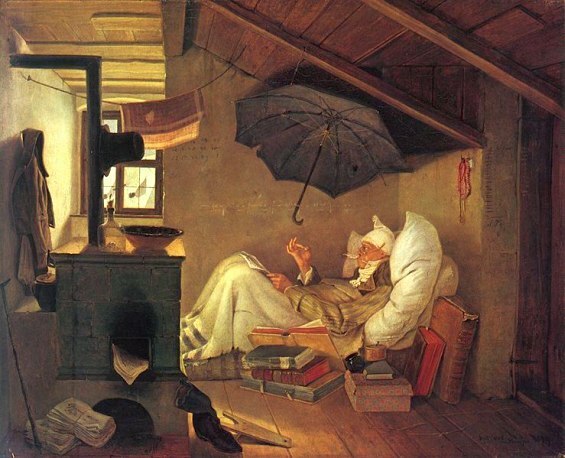 The worn and misshapen umbrella hanging from the ceiling to ward off leaks is perhaps one of most iconic images of all of Spitzweg’s nearly 1,500 paintings. A poll of Germans listed this painting as their second favorite painting of all time. Leonardo da Vinci’s Mona Lisa was foremost in their hearts. The Poor Poet has often been used in literary works to exemplify the metaphor of the starving artist. Unfortunately, this painting has been stolen on two different occasions. The thieves in 1989 were more successful as the original work remains among the missing. The same fame that made it such a desirable target for thieves has thankfully left the world with at least numerous photographs of this charming painting to enjoy. If you would like to learn more about this famous artist and see more of his work, please visit our Carl Spitzweg biography.